Hi Friends, I’t’s been real busy around here! After one hurricane and then a second ; we sprung for that all-important generator! Thank God we haven’t needed it yet! We made it thru with no flooding except a little water under the tool shed and an 8ft. peice of roof-liner came down. Jim got that back up easily. Afterwards, he took advantage of sunny days and painted some shutters, rails and entry doors. we are still a bit slow on the last of the paint detailing, but it is so minor that we barely notice. After all that hard work on this home, we are settling in. Since winter is finally bringing it’s chill, I have been knitting for my relatives. I’m really into making gloves. Most people seem to avoid them. But I’ve learned a few tricks to have them come out nicely. If you scroll back to previous posts, you will see some. Since the plain gloves- I’m using the same Vintage 70’s Patton Yarn book; but now I’m working out different yarn weights and needle sizes. Plus, I’m trying out a different stitch on the back of each one. (See February posts for basic men’s glove pattern ) You can adjust sizes and style easily! Since I don’t want to be one who just shows off what I made, and offers no substance- I will be returning to this topic with some hopefully useful information. On top of that, I made my Mom and us both new yard flags, finished a few alteration projects for her, and made Mom a custom crossed-back apron from a hand made cut-out lace curtain panel. It was a white panel with buttonhole stitch cut-work. The photos above show the apron as a work in progress. Then you see the card, some of her cookies, and a vanilla chocolate chip cake I made. In her appreciation, she reciprocated the love by sending me a hand picked set of cookie cutters! In the box were 2 Wilton’s decorating books, some icing piping tools, bags and even cello bags to put the finished cookies in. These will be the kind with the hard Royal icing and piped decor. She even wrote out her recipe for gingerbread cookies and her own signature Almond Honey cookies. (I can’t post the recipe without permission) I’m not ecpecting her to give it to me! So, the rest of this week will be spent making cookies and knitting in the evening. I still need to get decent photos of the latest gloves- but I just wanted to give an update. So, I’m taking a poll- What are your main interests? Posted on November 14, 2018 November 14, 2018 Categories Cooking/Baking, DIY Sewing-Crafts-Home Decor, fiber art, UncategorizedTags Hannukah CookiesLeave a comment on Time to Play Catch up! Who from the boomer generation doesn’t remember that Credence Clearwater tune? As we’re waiting for the inevitable flooding that is to come, I’m sitting on my screen porch getting a little bit of natural light and trying to do some knitting. It’s funny how not much knitting is actually getting done, with my brother calling and other distractions. One of which is the amusement of watching the cardinals feed in the rain, looking for insects that are washing up. I managed to get one photo, and had to get wet to get It! We are in the second day of no power. Thanks to our neighbor’s generator, we had coffee. My husband made breakfast on the grill out back under the carport. I had managed to bake a meatloaf and make a pot of soup yesterday before the power went out. That meatloaf was delicious with the eggs this morning! It’s a good think I kept that cast iron skillet! As for the power, it may be a while. I’m tempted to take a drive and assess the town around us, but good sense rules that out. We have some T-bone steaks to BBQ for dinner. Tomorrow is my birthday. Perhaps I’ll try baking a cake on the grill? We are in Lumberton North Carolina, and waiting for Hurricane Florence to dump it’s load of wind and water. Right now, it’s 6:35 Eastern time. The grocery stores are closed, and everyone is just waiting. This town had a devastating flood in October of 2016, from Hurricane Mathew. Our town’s residents were all too ready to clean out the stores for supplies. As early as Tuesday, people were seen fighting over bottled water at the local Lowe’s. I lived in Tampa Florida in the mid 70’s. A hurricane came up the eastern coast that year and I remember the force of it, even though all we got was the fringe of the storm. It passed thru the night, and was over. This storm is predicted to be much different. The very fact that it is travelling at a slow pace is the very worst news. We are not talking about wind speed. We are talking about a prolonged pounding of nature’s fury! So, many of you are following this; but my family on the western side of the country are terrified for us. You could say this is the calm before the storm. It’s been just pleasant breezes all day, now starting to pick up a bit. Our town is marked by forcasters as being in the zone most likely to recieve 20 inches of water! Keep in mind that we are a river town. The Lumber river snakes thru the landscape from the western mountains. The very fact that the storm surge is expected to force water upstream , is perhaps the reason we may experience another catastrophic flood. For us, our home was not in the 2016 flood zone. That’s one of the reasons we purchased it. My biggest fear is having trees crashing thru our windows. Even the double storm windows is no match for a large tree limb. We have plenty of food and water, propane and a tankful of gas in the truck. Our next door neighbor has his fishing boat, just in case. They own a double wide mobile home at the beach and returned yesterday . I’m quite fearful that it won’t be there for them to go back to. At least they have the house next door. Here is a link to one of the latest reports, including a live video. I will return and provide updates as this storm moves into our area. If the power goes out, It may not be right away. It could in fact be a while before utilities are back up. It’s 15 minutes later… I peeked outside and a sudden and huge downpour of rain hit us! Here’s my screen porch just before I moved everything. Notice the curtains ballooning? It’s been quite some time that I could sit down and enjoy sewing again. Being one who spent most of my adult life sewing for a living; I never had time to simply create. Now, with no brides to tend to, I’m having a new burst of sewing enthusiasm! The first of these trips was to an enormous indoor flea market near our home. I discovered the place on a bike ride several months ago. I only made it thru half the building on the first trip, purchasing metal containers for my screen porch to use as plant holders. I noticed a stall with a large amount of decorator fabric samples. These were beautiful, and large enough to make 2 placemats apiece. On this second trip I looked at those again, then quickly lost interest when I peered around the next corner! There was a HUGE booth with 3 walls of fabric!!! Now, these were all decorator cuts, displayed in cubbies by color. Anywhere from 1.5 to 5 yards each, no cutting allowed. One had to purchase the entire piece. I ended up buying some heavy weight white cotton twill, a white duck, and the same goods again in a natural color. A good start for developing patterns with. THEN, I delve in deeper towards the other booths. In a few minutes; staying focused on my objective: to hunt down fabrics; I struck gold again! I found a booth loaded with all kinds of lace, trims patterns and other notions. And in the back there were sealed plastic bags of vintage fabrics! I bought up everything in cotton, and avoided some impulse purchases. In this score were some children’s prints, as well as a few others. Choosing only the cottons, I finally made it out of the place with minutes to spare by closing time. So, home I go, and every last yard gets washed and dried, folded and stacked. With the new vintage goods, I started making aprons for young school kids. My first plan was to make art aprons out of the whites- the kind of basic things that are meant to get- Painted on! There’s only one problem with that… Plain is boring! So, I designed a white apron with printed trim, with the facings turned to the outside. A few for boys, a few for girls. 2 sizes. Next up; there was some lightweight denim. I drafted a new pattern with a sandwich board shape, round corners- side ties. Using the same 2 prints for trim as before, but a different result. Then, the upcycle jeans bug bit me!!! 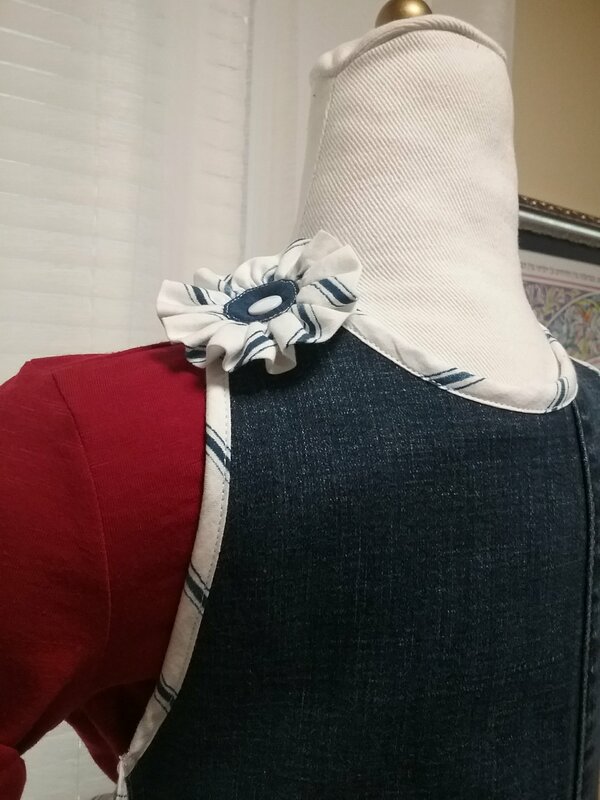 Adapting my first basic pattern, with a different trim, I made 3 little girls’ denim aprons with white and blue trim. The big change to the first pattern was the neckline and the width. 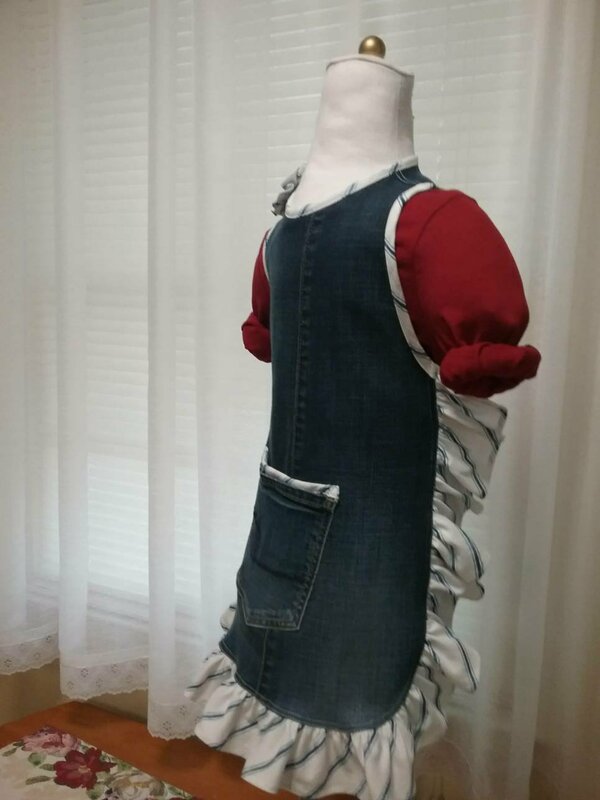 I made a neck peice that was shaped like a deep back-neck facing, and closed in a snap with a ruffle. Proceed to sew up 3 of those- all that white and blue cotton would allow. Sew up a few more sandwich style- suddenly I have a closet full! The necessity of a model posed it’s own issue. I have no little kids in my family! And even though there is a school yard 2 blocks away, I wasn’t about to approach a child! Lucky me, I found a pattern on ETSY for young children’s mannequins! (I’ll write a post on making the mannequins and a link to the shop soon!) I printed out the pattern, and found a purpose for that super thick white twill. Now, my plan was to make 2 of these, in fact I did. Only one got stuffed. It took so much stuffing, that I had to use every last bit of stuffing I had; even scraps and overlock trimmings went into this thing! I’m sitting here feeling quite pleased with myself! When designing new styles; remember that patternmaking and sewing prototypes is not profitable. Don’t be discouraged! I’ve been working on these all month and am just ironing out the details in my processes. Literally! You will make a profit later after you get your methods refined. In the initial design development phase, use all your trims and goods on hand until they are depeleted. Or until you have a clear sense of where you need to spend your money. Then, plan out your spending! Do not get carried away in the fabric store! If you have a coupon, use it. Remember- those stores (Joanne’s) issue new coupons nearly every other day. Do not make the mistake of constantly re-inventing your items or your process. It’s O.K. to draft a basic pattern that can be sewn up in several fabrics, but if you are constantly feeling like nothing is good enough, you will never be ready for market. Try to get into a 6 month-ahead rhythym. Fall is on top of us now. We should have our Holiday merchandise nearly ready to list, if we haven’t done so already. In all truth, I should be thinking about next year’s Bridal accessory market, and working on white goods. The reality is though, I still need to take photos and list the kid’s back to school aprons. If you find yourself like me, always running the machine up to the break of a season, we are never really ready. And another season passes us by. Not unlike the surfer who just can’t catch a wave! But we have to set goals, and work on reaching them. Giving up is not an option! Not if you want to go from hobbyist to Professional with your crafting and sewing biz. Whatever you do, strive for the highest and most consistent quality you are able to offer. Your reputation is at stake, and the repeat customer is well worth cultivating. Enjoy the process! It will take time to learn what works and what doesn’t. The take-away is this: Design development is expensive and time consuming. You may or may not have a line ready one season, but if you stay focused and diligent; it will all come together! I want to share some of my personal story, how thru life’s twists and turns I learned and evolved as a crafts woman and designer. This is a lenghty post! Mom and Grandma often sewed when Grandma visited. This influence really got me interested in sewing. A lot of what we learn creatively is visual- seeing what others are making or have made. At age 4, my brother and I got out my Mom’s scrap box and traced our hands to make puppets. We hand stitched the cut-outs and turned them right side out. His fit, mine didn’t. He was 1-1/2 year older, and knew to add a little extra for seam allowances. I was going to make another one. Suddenly, Mom walked in the room to see what we were up to. She yelled at us for getting into her stuff and took everything away! It wouldn’t be until I was 6 at Christmas that I was encouraged to do any kind of needlework. She explained to me 20 something-years later thr reason. It was the pediatrician who told her not to let a child handle do small detailed works in order to protect the developing eyes! He said to wait until I was 6. At that age a child is beyond the risk of permanent eye damage from such use. I don’t know if that’s true- it was after 1963. So, when I was 6, my Mom started Jay and I with simple knitting. Then she took me to the dime store and bought me supplies to embroider a pillow case. At Christmas I was given new Barbie dolls, and pre-printed Barbie outfits to cut and hand stitch. That was the beginning of my creative obsession. At age 8, I was given a real sewing machine. It was a used White brand, and only did a straight stitch. Mom was using a Necchi with a zigzag. It was a wedding gift- Brand new in 1955. She still has it! I was allowed to use hers if I needed the zig-zag, if she wasn’t working on something. It was at this time of my life a driving passion for all kinds of crafts was ignited! I checked out one particular library book so often, my parents bought it for me at Christmas! It was loaded with all kinds of needlecrafts! I also knit little sweaters for Barbie, and made little doll clothes. I could be up in my room for hours on end. Then at 10, Jay and I took oil painting classes at a hobby store. It was Hal’s Hobbies. He and his wife taught a variety of classes, but our parents could only afford the paint classes. That came to an abrupt end when Hal died of a heart attack. I’m using that picture as my feature image, since it is the only surviving work of my youth. Even at that age I was making simple clothes and wearing them to school. I was totally clueless about fashion trends or style, but I didn’t care at that point. When I was 12, the McCalls Pattern Company announced a sewing contest being held at South Coast Plaza. This was in Costa Mesa California. I had made a royal blue tailored pant suit that was flawlessly made, and fit perfectly. So I entered it in the contest. To my disappointment, I didn’t win- not even 3rd place! What I learned from that was to be mindful of the season being promoted in a contest like that. It was all about spring, and seer-sucker fabric and strawberries were the trends. I kept sewing, and got good at making shirts for my brother, having made the sleeves too short on the first one! The shirt was otherwise perfect. This was a live aand learn process, because Mom didn’t teach me these things. She was busy with other things in her life. As long as I was keeping busy, she didn’t have to worry about me! By the time I was 20, I had a baby and we got married when he was 6 months old. One day my Dad came over with a handcrafted clown doll he purchased. He thought I could make some money on them. It had a block of wood covered with a loose outfit, a styrofoam head, and yarn hair. He sat on the bottom of the wood block, and worked nicely with his feet dangling from a shelf or dresser. Do you remember those? That was the first thing I ever made! Shortly after, my husband told me of a little alterations store nearby. It was called “The Button Box”. They did tailoring and general alterations, and sold notions. True to the name, the little front room was covered with walls of buttons! I went and introduced myself. The owner, Hope- sent me home a project for a customer. She was often asked to do custom sewing; but didn’t really want the work. The first project was a pleated little skirt for a High School cheerleader. I made it perfectly- (so I thought) but when it was all finished, I realized I had the lapped side zipper facing the wrong way! I asked my Mom if she thought the shop keeper would notice- the answer was- “Of Course she will- don’t you think she’s going to scrutinize every stitch?” So, I fixed it, and my sewing career was born! After a few years, sewing as a “GHOST SEWER”- meaning the customer was never to know she sent the work out; Someone mentioned that Bridal Shops were good places to get a sewing job. That person was right! After I got out the phone book and made a few calls, I had a sewing job in a shop! One such shop was “Penelope of California”; in the city of Orange, Orange County California. This was around 1983 to 1986. Penny taught me how to create a dress pattern by draping fabric on a live person, and using that “muslin” to draft my pattern. She was happy to teach me everything she could. Nearly all the custom gowns I designed were created using this method. It was later in my career that I started to push myself to work by drafting patterns strictly on paper, without the customer standing for lengthy fittings. I was simply doing what I was taught. As my skills developed, I began working with the customer on site less, having done more work in the back-ground to be ready for her first fitting. Still, I use those skills to bring a design to life, once the customer tries on her fitting muslin. I simply do not start with scraps pinned to her undergarments the way Penny taught me! All through this period, I was going thru a personal crisis. Having left my husband of only 4 years in total, our kids ended up in foster homes. I was still not able to support them. Phil had his own problems. After a while, having settled into a Newport Beach apartment, the courts gave him custody of the kids. I was living with Mom at the time. In less than a year, he would come and drop the kids at our doorstep, and leave the county, not to be seen or heard from again for several years. The reason was due to a crime he had committed- he was afraid he would be procecuted for child molestation. ( He passed away in 2006) . His first wife had severral children. At the age of 14, one of her girls told her mother of the molestation that occurred when she was very young. Ultimatly, charges were never pressed. I had to get help from social services and quit my job. I started sewing at home again, having a great studio space available to me. While at that particular residence, and before Phil brought the kids back; I would start design school at FIDM, but dropped out . I had met an L.A. designer named Sharon. We had volunteered as cast member’s in the 1983 production of “The Glory of Christmas” at the Crystal Cathedral church. This is the famous glass church built by Robert Schuller Ministries. He was a kind man, we shared the same birthday! That year, I followed her around, telling her I could sew. At some point she decided to take me seriously. One Christmas, I started making hand painted silk scarves. We rented a kiosk at the new Main Place Mall in Santa Ana, California. I sold about $9,000 worth of scarves that were completetly hand sewn, dyed and painted. Can you imagine my hands? My Mom still has some of those scarves- One large scarf was actually purchased as a gift for an executiver auto builder. I wonder if he still has it? I sold that 45 inch square of silk for $100! As usual, styles changed. People stopped wearing scarves. They are back again, but I’m not set up for the mess in this home! I was single for 33 years after a short marriage to Phil King. We have 2 kids, Mike born in February of ’79 and Crystal – born in January of ’81. Then there is Damien, my third child who was of another father. He was born in October of ’86. I had to give Damien up for adoption because I did not think I could take care of three kids by myself. My Mom kicked me out of the house when she found I was pregnant, and Mike and Crystal ended up in foster homes. They spent several years being moved from home to home. Their Dad, P. King was nowhere to be found. He had just dissappeared. When it came time for permanency planning, The social worker asked if I knew how to find him. I suggested they track his social security number. Why couldn’t they think of that? It turned out he lived in a flat in San Francisco’s Sunset District. Phil was excited to have a chance to get the kids back. Ultimately, we all moved there. (June 30, 1994) After a brief stay at Phil’s friend’s apartment nearby, I rented a basement studio under a house. It was the perfect little apartment to start over. after 2 years, his stability fell apart when his boss died of lung cancer. He could not keep up the bills, and eventually hit rock bottom. At that point, he gave me back the kids. We finally got our own apartment closer to downtown, on the south side of Nob Hill. It was a lovely place with hardwood floors. I stayed there for several years, until going back to Orange county. (After 1-1/2 years I returned to S.F. only to find the rents had tripled! ) That began the secend part of my 12 year saga back and forth up there from Southern California. By the way, I’m from San Diego, and moved to Orange county at age 10. Back to the San Francisco part of this story….. I got jobs easily in the Bridal studios in town. While job hunting one day, a sweet japanese designer who had her own studio gave me a suggestion. She told me to go to I Magnin’s and apply for the alteration department. This was actually life changing! That high-end store in Union Square was the company’s Flag-Ship store. Meaning the first, and well respected in a small chain of stores . So, I passed a sewing test and was hired. That workroom had 40 women and 3 men who were from many countries around the world. Even though there were language barriers; sewing has a universal language of “Show and Tell”. It was for me Couture School! I was a fitter, and was sent to every clothing department in the store. I learmed about clothes and designers I never even heard of! This was an amazing experience! One day Iwould be inside a $6 to 10,000 Valentino beaded gown, another day it could a resizing of a $4,000 Chanel suit. So, after the store closed and was absorbed by Macy’s; I met and came on board with Angelo DiRosa. He was a handsome 38 year old blond. I was swept off my feet. Except therre was a big problem. He was gay and had Aids. So did his partner Jimmy who worked in the Tuxedo company our studio shared space with. They would pick me up for work and drive me home most days. Angelo would sell a wedding dress, and I would bring it to life. Finally, he got to the point where he had to stop working, and I had to find another job. There were other Bridal jobs in San Francisco. The phone book was my best friend! I’d simply go down the list, and in a few minutes I had interviews. If I got the interview, it meant they needed help and I’d go to work! This led me to La Boutique Des Brides at the Gift Center Jewelry Mart. The owner , Hilda was a 50-something Armenian lady who was raised in Paris. She had a beautiful French accent and was nearly always sweet. Her 82 year old mother came to work with her . She sat on a small sofa all day and basted the hems, to mark the line. Here’s a tip: never mark a light colored fabric with dark thread. She used bright magenta and deep blue so she could see, and it always left tiny dots on the gown! After a while, I got her to use pale pastels, even though using white was the correct method. But it was a compromise I could live with. Believe it or not, at one point I had worked in 4 shops in that building! Hilda’s competitor, Marie, would try to catch me when I went to the restroom to look at dresses on a customer. Ultimately I worked it out to take her things home, so I wouldn’t get fired. Then, there was the Furrier who had a shop directly the Bridal Boutique. She was not a compettitor; so Hilda didn’t mind. This was Furs by Ettienne. All three of these shop owners were from Paris! Ettienne taught me new skills in the few hours of the morning. I learned to secrets of working on fur. Not to say I mastered that trade, but the experience added a new skill set to my “tool-box”. Then there was David’s Bridal. It seemed like a dream job to become the Alteration’s Manager there. After 9 months, I had enough. The stress level was horrific! I won’t slander the company- but I was happy to leave. I needed to get back to a creative flow. So, soon after I decided to leave the San Francisco area. This was mainly due to a relationship gone sour, and I needed to put some distance in it. I put all my belongings in a storage unit, and took a Greyhound bus to Phoenix Arizona. I spent about three months enjoying the early spring in the desert. The watercolor on my home page was done then. My Mom’s place was on the edge of the mountain range in North Central Phoenix. I did an earlier painting with realistic colors. This one, I just animated the colors. But the scene was realistic in detail. There is a mate to that painting, to show the other half of the view. At the same time, unknown as to myself, my brother was purchasing the 10 acre estate in the desert outside of Yucca Valley. The property was 10 miles from town. A huge ’80s stucco house, 3000 square feet plus out buildings. And there was the high desert all around us! That’s when I came on board with him, and my Mom and I drove back to San Francisco to get my storage. I had to leave behind an antique 4 poster bed, and 2 dress forms. I simply gave them away to grateful people who happened to be at the storage facility . With her help, I pared down my posessions to what would fit in a “professionally” packed Ford Windstar van. Mom and I drove the back highways down the state, enjoying the countryside. These were roads neither of us knew so we made an adventure of the trip. We were on our way to Dean’s newly purchased property. Then the advertising balloon making phase began! My brother had just purchased an estate with a large workshop for his business. Having spent many years as a successful Bridal Dressmaker in the Bay Area, the move was in Perfecly Divinely Orchestrated timing. My younger brother, Dean was in the advertising balloon business. I was entering a business I knew nothing about! But, the sewing skills set I had were more than ample to fit the job . I became the creative machine, while he was the master salesman. we sold a lot of products, some of which I had my hands on; some not so much. There were the giant inflatables that were custom made in India. I made the patterns for all the sky dancers. Then there were the helium blimps, cutting giant stencils and painting company logos on them. Pop up tent banners, inflatable tubes with a pig or a crab, I made them all- and created the patterns. On top of this, I had to train seamstresses to produce product. There came a point that I got bored with that business. I needed to get back to my first love- just making things spontaneously! One day, I looked at all the ripstop nylon scraps being thrown away. A frugal person never wastes… especially when it could become another product! I got the idea to make windsocks! All those long scraps trimmed from the patterns of 15 to 20 foot balloons were perfect! So I started saving everything I could get my hands on. When my brother decided to close shop after a family tragedy hit, I was allowed to take whatever I could use, including two industrial machines -a newer single needle machine and overlock, I only wish I had grabbed the plotter! So, in my little rented house in Joshua Tree CA; (the next little town on HWY 62) – I sewed. I had 2 dogs, and occasional adult children living with me when they needed a landing place. My brother was in mourning from losing his 8 year old disabled son. He travelled the country and exotic places like Balize and Europe. Meanwhile, I salvaged the documents abandoned in his office. I made calls from his customer files. I managed to squeek out a living with the fabric, patterns and machines Dean let me take home. And I really got into making those windsocks! This was a fun phase, which ended with a Severed Achilles Tendon ! ( August of 2008) I was dancing in church when it happened. After several months of dealing with the surgery and recovery, my business died. I had to give up the sweet 2 bedroom house I rented. My Mom said “Come to Phoenix!” So, this time it was really hard to tear down a home, because I had done so much to make it mine. I had lived there 3 years. There was a lovely pond surrounded with lush flowers in the front. All my own hard work. Remember, this was the desert. My yard was nothing but sand lined with several large boulders. It was now the oasis of the neighborhood! There was all the furniture I had to sell or give away! My sofa and loveseat had come from a thrift store nearby. They got it back 2 years later with my new slip covers I had made! I wonder if they recognized the set? Then there were the two dogs. Bear and Mikey. Both Rottie/Shepherd mixes. Not related, they looked very different. Bear was enormous. Mikey was a medium large dog. My friend Diane took them home. So, with my heart breaking and my Achilles mending, I settled into Phoenix Arizona. (It was May 3rd, 2009) I healed and found another Bridal shop to work for. This would be Azteca Bridal. Then another tragedy struck! My son, Mike was killed on May 30, 2010. He was shot by the police in Joshua Tree, California. I got the call around midnight, the event happenned early that day. He was mentally ill, and supposedly attacked an officer when he was approached. I knew this was plausible, as he had become increasingly violent over the years. So, I chose not to persue the matter and let “sleeping giants” alone! I had been back in Phoenix for just over a year, and working, going to worship services with my Mom, and learning all about the computer. During the time of my Achilles recovery, I really had an opportunity to get involved on-line with Craftster.org. I loved the different categories, and got involved in many craft swaps. This was instrumental in my learning to take and post photos, as well as other P.C. skills. I was nearly computer illiterate until then. Up until then, my brother had taught me to use a plotter cutting ptogram for lettering and other stencils, but I basically had no other skills. It was thru Craftster.org that I first learned about Blogs and ETSY. During this time, our community had an interior decorator/dressmaker pass away. I purchased all I could afford, having to walk away from supplies that I only wish I could have snatched up. The haul included over 300 patterns, boxes of lace, and even a pattern cabinet! My ETSY shop was born!!! This is when I met my now husband, Jim! We became friends and after 6 years, we married. But I had to go away for four years to take care of my Dad in California. Jim called me constantly. He really was my best friend. Finally, we got engaged over the phone! The changes happened pretty fast after that. Jim and my mother flew to California to bring my Dad and I back. We got married on Oct. 2nd, my Mom’s 80th birthday! After a while, Jim decided to move to North Carolina. His best friend, Dave kept asking him to come and help him in the Ministry. They are now very involved together in local prison ministry, and other community service. After past several years of getting married, putting my family first, moving, renovating, and finally seeing life begin to settle, I am now starting to create again! I’m experiencing a burst of creativity as I do my final sorting after the move. I’m down to this mountain of craft supplies in my little back bedroom. This is the sweet little room that’s all mine; including the stacks of things all around me. None of it can get donated. All of it represents about 13 years of collecting since I left San Francisco in my mother’s van. I am full of ideas now! They are rushing in like a flood. There is rip stop nylon. There is a huge stash of yarn and stitchery supplies. There are fabric trimming from the bridal alterations. I have a box of dolls I planned to make clothes for. There is a bin full of leather skins. Stencils I made for windsocks, and large format lettering in vinyl and stencils. There’s all the paper goods. Beads of all kinds, including real semi precious stones. Not to mention all the unfinished works, There are wool fabrics for winter wraps and jackets. And random fabrics, trims, the list goes on! So there’s my problem! I have too many options! Right now I’m working on aprons. I’m going to sew up all I can out of suitable fabrics on hand, and purchase what is needed . The plan is to list them in my much neglected ETSY shop. Then, I’ll spend a few weeks on the rip-stop nylon, and make up some windsocks, yard flags, decorative banners, lightweight shopping totes, maybe even some fanny packs, I read today those are hot items! After that, perhaps I’ll do something with all that wool yardage. Easy things. Forget the hard-core tailoring. I know to do it, but It’s very time consuming; and I have a lot of sewing to get done! I may save those purses and small leather items for later. Definitely put some jewelry pieces on the list. And what am I going to do with all that yarn? Use it as a decoration? I’ve been doing a lot of reading on Pinterest. Greetings! Today I made my “Home Made Pizza Dough” with an extra ingredient-Rosemary. I simply ran the rosemary thru the blender and used the fine powder grains. I put the entire jar thru the blender to allow the machine something to work with. After the dough was mixed, I kneaded it in. You could add it to the wet batter before kneading, but I thought of it after the fact. Note- I’ve never used a bread machine in my life- if you want to use yours, use the same proportions but take it out of the machine for rising and baking. Put the 1-1/3 cups warm water in a glass measuring cup or small bowl. Add yeast, and sprinkle the sugar. Let yeast activate. ( It foams up in a few minutes) Make sure your water is warm- not hot. Too hot water will kill the yeast. Sift 4 cups of flour into a large bowl. Set aside 1 cup of this flour for kneading. Stir the salt well into the flour. Pour the water/yeast mixture in the center of the 3 cups flour, add oil. Mix well with large fork. Turn out dough onto clean counter top or pastry board, dusted with some of the remaining cup of flour. Knead in remaining flour. (about 10-15 minutes) Kneading is a technique requiring practice, but any one can do it! To Knead, sprinkle dough with flour, and use the balls of both hands to press the flour into the dough. Turn dough a quarter the way around, adding small amounts of dough as you go. Keep this up until you have used all your flour. Dough should feel satiny, not sticky when done. It will have a springy feel to it. If your kitchen is cold, your dough may not respond well. I made a batch in the winter, and the dough felt tough. But we made the pizza anyway! Lightly oil a clean mixing bowl, preferably glass- since metal can be cold- and turn the dough into the bowl; sparingly oiling the ball as you do so. Cover the dough with a clean lint free dish towel. Run it under hot water and wring out the excess. try not to let the towel fall down in the bowl. Set the dough to rise in a place away from drafts. The oven without the heat on is perfect! If you have to use the oven for something else, the microwave is another good place. In about 1 hour, the dough should have doubled in size. Punch it down, roll back into a ball, and cover as before, let it rise another hour. After first rising,punch down the dough. You now have your pizza dough! You can divide the dough in half and freeze the other half in a 1 gallon freezer bag. Just set it out to defrost the morning you want it for dinner. On a floured surface, use your rolling pin to roll out your dough. It will take a bit of effort, as the dough likes to creep back on you. Keep turning as you roll, until it fits the pan. Lightly oil a pizza pan. Place rounded shape into pan, and push up the edges all around. You can Pre-bake the crust for a crispy pizza for 5 minutes, or just go ahead and put your toppings. Spoon a few TBSP. Chef Boy-Ardee’s Pizza Sauce, or your own preferred sauce. Spread evenly out to the edges. Layer some shredded Mozzarella Cheese over the sauce, REPEAT. Add any toppings you wish. Finish with a final sprinkling of cheese to bind it all together. BAKE at 400 degrees for 15 to 20 mins. If you pre-baked your crust, you should shorten the baking time. Keep a close watch until you know how your own oven bakes your pizza. See the old brick Hearth? Love the slate and quartz hearth! We’ve been busy behind the scenes, and there’s a lot to share. We just celebrated our first anniversary in this home, on June 9th. My husband, Jim has slowly been attending to finishing details on our remodel/ decorating projects. New granite counter tops and backsplash in kitchen. The countertop granite was ordered at Lowe’s. Pattern: “Crescent Veil”; the backsplash was purchased at Home Depot. “Honey Onyx”. My husband put in the backsplash himself, along with all the tile, and refinished all the original hardwood earlier last year. He finished the fireplace! Earlier in the past year, he stripped down the existing wall surface to the studs, and rebuilt it from the cement board out. We chose a 6×12 mosaic called “Desert Quartz”. The hearth remained, as we had to live with the tired old red brick that clash with our gorgeous new stone mantle! Finally we found the perfect slate tile to match. I believe it was called ‘Mongolian Sunset” or “Mongolian Desert”, depending on who was selling it. We found it thru a “for trade- only” source in Fayetteville, N.C. I think they are Del-Tile. Anyway, to keep the hearth from looking like an afterthought, Jim used the same quartz around the edges, and topped it with the slate. The result is AWESOME!!! Next, he got busy with lighting and ceiling fans. Jim removed the ugly brass fan in the great-room, (It was too low and out dated) and installed an LED tract light. We went with the chocolate color to blend in with the beam where it had to go. Then, he installed 2 new ceiling fans in our room and his office. The screen porch has been decorated, for the most part. I bought outdoor rugs from E-SALERUGS.COM . Having ordered from them once already, I am thrilled with my second purchase! Although most of our home is leaning toward the blue-green-yellow-beige color story, I went with a modern damask design in the berry/gold tones. The deciding factor was the marble table top I inherited from my Aunt. It has grey, cream and peachy pink. The rugs were perfect! In same area, I spent the spring attempting to grow an herb garden. Most of those herbs didn’t make it; but I have a few plants that did. Mostly, they are not edibles. I did install some white curtains in 3 sections of the screen porch, mostly for privacy. Since we like to watch the birds, I did not want to close it all in. I used tension rods since I did not want to puncture the aluminum framing. I still need to re-screen the door, and one or two sections. Finally, we are down to sorting things,( Like my hoard of tools and craft supplies) and finishing up the remaining plugs and switches, changing a few light fixtures, and other details. A bit of touch- up paint. re-hang some closet doors. Paint the front door and shutters, rails. Plan next year’s outside planting. Oh, those windows that need repair! And, last but not least, there is that not-level bathtub and plastic surround that my husband wants to pull out. I’ve already chosen the new tub- He wants to replace the surround with tile. It’s a pretty cream colored crackle finish subway tile. Here’s the tub I want. Thanks for reading! In my next post, I’ll show the finished kitchen with the new counters and backsplash ! Please browse my archives; I’ve just combined my old blogger posts with this new blog. There’s a variety of craft and lifestyle posts. I’m still editing the tags and categories. Also, I’ve linked my ETSY shop. I’m sorting craft supplies- destash coming soon! Posted on July 4, 2018 July 14, 2018 Categories Home Improvement, Stone and TileTags custom tiled fireplace, desert quartz tile, diy fireplace reno, fireplace makeover, great room reno, Jim Gonzales, mongolian desert slate, tile and stone1 Comment on DIY Fireplace Renovation Reveal!